How many of you are decorating more than one Christmas tree this year? I have a blogging friend who displays 10 trees throughout her home during the holiday season. Yes, you read that correctly… ten… but then, she is pretty amazing. I’m not that amazing but I did decorate a second tree recently after partnering with Balsam Hill which is well known for realistic looking artificial trees, wreaths, garlands and amazing ornaments. When I first opened the box of ornaments, I actually thought they were pretty enough to eat. Not literally… but you know what I mean. I’ve been shooting pictures of holiday food so much lately, I think that may have influenced my initial reaction… as well as how I choose to style and shoot these next few photos to show off these ornamental gems. Scalloped cake stands are for more than just delicious cake. I told you these ornaments looked good enough to eat. This particular set of ornaments is from the Brilliant Bordeaux collection and I don’t mind saying that these are some of the prettiest ornaments I’ve ever seen. I’ll admit, these glittery gems are a far cry from the more natural and rustic tree decor that I shared here last week and what I’m typically drawn to. But to my eye, there’s still a somewhat vintage aspect to these ornaments… as if they’ve already been around for a hundred years. The combination of sequins, carefully-placed glitter and elegantly designed beading is just stunning. And hey, it’s always fun to stretch and work with new and different materials. These bulbs definitely have an heirloom quality to them that comes from more than their ornate and delicate detail. They have a weight and heft that just makes them feel far more substantial and long-lasting than typical ornaments. They’re built to last a long time. Ahem, did you catch that reflection in the red glass ball? Meanwhile, Balsam Hill also sent me a gorgeous, artificial Classic Blue Spruce to work with. And there are five things that really stood out to me right away. I love that the tree is pre-lit. No need to struggle with multiple, tangled strands of lights which is what I usually have to do. The tree came with its own tree stand. That sure makes things simple because it’s a perfect fit. This Blue Spruce was super easy to put together in just minutes by just snapping the three tree sections into place. Light plugs are located down inside the tree trunk sections. Two sets of gloves were included in the packaging to help protect hands from those prickly branches while shaping. Now that’s considerate, isn’t it? A large vinyl, zip up bag with sturdy handles was included in the box for easy tree storage at the end of the season. I selected a 6 foot “narrow” tree and while it’s tall, narrow does actually mean narrow. If you prefer a tree with a fuller, thicker waist, consider getting a “wide” version. Regardless of the tree girth, you can always fill in any gaps with “Buffalo Snow” as I did here for a beautiful and winter-like presentation. NOTE: You can find Buffalo Snow at your local crafts store. It’s a large, folded sheet of soft cotton that comes in a big plastic bag. Break off the pieces of cotton and stuff them into the branches to fill the gaps and create the look of fresh snowfall. I also added artificial, sprinkle snow on select branches for additional realism. It was fun to incorporate a little extra glittery goodness into this tree and I used a gold fine mesh ribbon to add simple twirls that cascade off the top of the tree. This is smooth, wired ribbon which holds its shape and is also very easy to work with. I created uniform, cascading swirls by gently wrapping the ribbon around a small cardboard tube (a paper towel tube will work too). After wrapping the ribbon, slide it off the tube. The swirls stay in place. Then, simply pinch one end of the ribbon to flatten it and wrap the swirled strand around a branch in the top of the tree behind the tree topper. I settled on short swirls but longer ones, that run the length of the tree would also be pretty. This is actually the first time that I’ve put up a Christmas tree in my favorite room in the house. Our music room/library is a smaller space with a lower ceiling which makes the room feel more intimate and cozy. Even though this tree is 6-feet tall, it’s narrow shape means it doesn’t overwhelm the tighter space. It’s perfect for this corner of the room. I really like having the bookcases as a backdrop to this holiday decor. And it’s nice to have a little colorful cheer introduced into this space which up until now, has always been pretty much neglected during the Christmas season. In case you missed it, this post was sponsored by Balsam Hill. My opinion about the high quality and gorgeous craftsmanship of these beautiful decorations and tree are my own and I’m genuinely thrilled to add this lovely seasonal decor to my Christmas stash to use for many years to come. The tree is so beautiful, Lisa! And I really like the ornaments as well! Lisa, I think your tree is precious, and I have always thought the red and gold combination at Christmas is so regal-looking. Your photography is excellent and so compelling. Love your chapeau! So right for this time of year!! I think Balsalm Hill products are great. I won a small tree from them last year and this year I ordered a nativity scene. I am so pleased with both. I can’t believe the beauty of the ornaments. I’d love to have some — perhaps next year. I hope the Christmas season is going well for you. Sending big hugs!! 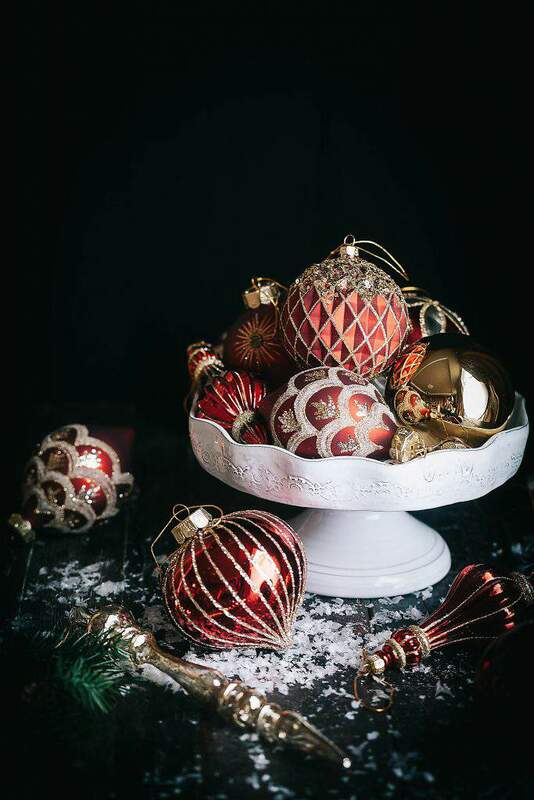 These ornaments are exquisite…your photos are stunning…a lovely display. Thanks for the inspiration. You’ve been a wonderful supporter this year and I appreciate that so much. Hope you have a wonderful and happy holiday. Lovely tree! What did you use for your snow? It looks so realistic in your photos. Happy holidays! Hi Amal, I love this snow too. I’ve never used it before but I got it’s called “Buffalo Snow”. You can find it on sale now at Joanne’s. It comes in a big bag and is essentially large sheets of cotton. You’ll probably only need one bag too because a little goes a long way. Break off pieces and stuff between the branches to fill in gaps. After that, I added artificial snow flakes to make it look even more realistic. It looks like real snow, especially from a distance. Very dreamy. Absolutely beautiful Lisa! I love that they sent you those gloves! Very considerate. I could have used them yesterday as I was making fresh garland! Ouch! And the snow ‘fall’ over the branches really makes that tree all the more special. Thanks for sharing my friend. I thought the gloves were a nice touch too. You definitely need them when working with branches and garland. I’ll be your garland is lovely too. Thanks for all your support and friendship this year. Safe and happy holidays to you. I’ve been looking at these trees for a while. My tree is starting to see better days and I think this will be a nice replacement! The ornaments are beautiful! I love those ornaments too. Also, double check in the post what I mentioned about tree width (narrow versus wide).